Figure S1. 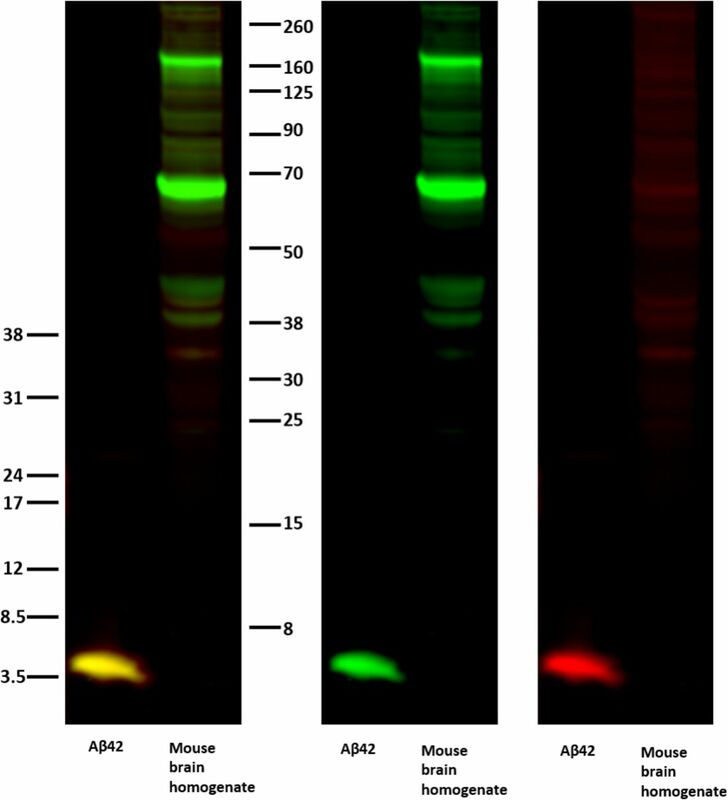 Western blot of Aβ42-specific antibody compared with 4G8 antibody. WB of purified Aβ42 and mouse brain homogenate samples were incubated with the Aβ42-specific antibody (anti-AβC42, red) and an antibody recognizing the Aβ sequence within APP (4G8, green). The merged channel is shown to the left, and the individual channels are shown in the middle and to the right. The molecular weight is shown by an Odyssey Protein Molecular Weight Marker (LI-COR) on the right hand side and low-range Amersham Rainbow Marker (RPN 755E; GE Healthcare) on the left hand side. Figure S2. Confocal images of negative controls for Aβ42, Synaptophysin (syp), and PSD95 in hippocampal neurons. (A) Hippocampal neurons stained with Aβ42 (red) and synaptophysin (green), using the same primary and secondary antibodies as for STED images in Fig 3A and B combined with actin (light grey) staining and imaged by confocal microscopy. Scale bars: 5 μm. (B) Negative control for synaptophysin (syp neg cntr). Hippocampal neurons only stained with Aβ42 (red) and the same secondary antibodies (Abberior STAR 635P and Alexa Fluor 594) as for STED images in Fig 3A and B combined with actin (light grey) staining and imaged by confocal microscopy in the same setting as in (A). Scale bars: 5 μm. (C) Hippocampal neurons stained for Aβ42 (red) and PSD95 (cyan), using the same primary and secondary antibodies as for STED in Fig 3C and D combined with actin (light grey) staining and imaged by confocal microscopy. Scale bars: 5 μm. (D) Negative control for PSD95 (PSD95 neg cntr). Hippocampal neurons only stained for Aβ42 (red), using the same secondary antibodies (Abberrior STAR 635P and Alexa Fluor 594) as for STED images in Fig 3C and D combined with actin (light grey) staining and imaged by confocal microscopy in the same setting as in (C). Scale bars: 5 μm. (E) Negative control for Aβ42 (Aβ42 neg cntr). Hippocampal neurons only stained for PSD95 (cyan), using the same secondary antibodies (Abberrior STAR 635P and Alexa Fluor 594) as for STED in Fig 3C and D combined with actin (light grey) staining and imaged by confocal microscopy in the same setting as in (C). Scale bars: 5 μm. Figure 1. Comparison of confocal and STED images for studying the synaptic localization of Aβ42 in hippocampal neurons. (A, B) Hippocampal neurons stained to visualize Aβ42 (red), synaptophysin (green), and actin (light grey) were imaged by confocal microscopy (A) and STED microscopy (B). Yellow arrows point at enrichment of Aβ42 at the synapse. Left scale bars: 10 μm. Other scale bars: 1 μm. (C, D) Hippocampal neurons subjected to immunocytochemistry to visualize Aβ42 (red), PSD95 (cyan), and actin (light grey) were imaged by confocal microscopy (C) and STED microscopy (D). Yellow arrows point at enrichment of Aβ42 at the synapse. Green arrow points at an Aβ42-stained vesicle where Aβ42 is stained only at the rim of the vesicle. Left scale bars: 4 μm. Other scale bars: 1 μm. Figure 2. STED images of Aβ42 demonstrating the intricate axonal network surrounding dendrites in the 21-d in vitro hippocampal neurons. (A) STED image showing Aβ42 (red) and synaptophysin (green) combined with a confocal channel for actin (light grey). The left image has a lower brightness in the actin channel than the right image. Note that the axonal staining appears for many axons only in the right image with increased brightness. This image was further zoomed-in in Fig 3A to focus on the synapses. Scale bars: 2 μm. (B) STED image showing Aβ42 (red) and PSD95 (cyan) combined with a confocal channel for actin (light grey). The left image has a lower brightness in the actin channel than in the right channel. Note the intensive axon network both between and along the neurites. Scale bars: 2 μm. Figure 3. STED imaging of Aβ42 focusing on the pre- or postsynaptic regions. 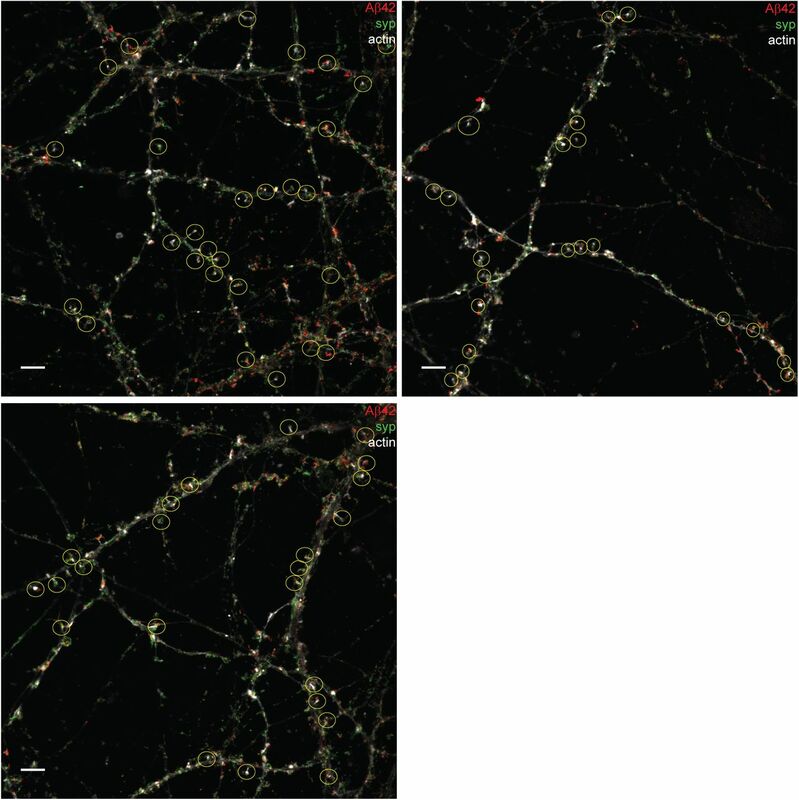 (A, B) Zoomed STED images of synapses showing Aβ42 (red) and the presynaptic marker synaptophysin (green). Neuronal structure is shown by actin in a confocal channel (light grey) merged to the STED channels in the left panel. The staining of synaptophysin and Aβ42 at presynaptic boutons connected to the postsynaptic spines are shown by the yellow arrows. The staining of synaptophysin and Aβ42 at “free” boutons that do not connect to the postsynaptic spine is shown by a pink arrow. Scale bars: 1 μm. (C, D) Zoomed STED images of synapses showing Aβ42 (red) and the postsynaptic marker PSD95 (cyan). Neuronal structure is shown by actin staining in a confocal channel (light grey) merged to the STED channels in the left panel. Yellow arrows point at Aβ42 vesicles in axonal regions opposite to PSD95-containing stubby spines in (A) and to Aβ42 vesicles in axonal regions opposite to a mushroom spine in (B). Scale bars: 1 μm. 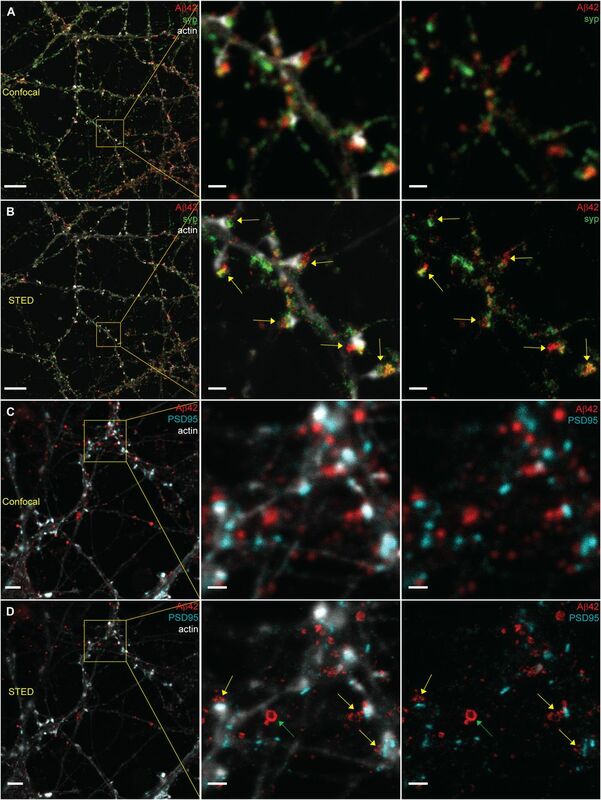 (E) Quantification of Aβ42 staining in pre- and postsynapses. The staining of Aβ42 combined with the presynaptic marker synaptophysin (green bar) or postsynaptic marker PSD95 (cyan bar) was quantified from STED data. Graphpad prism was used to prepare graphs showing the proportion ± SD of presynapses (n = 73) and postsynapses (n = 73) that were positively stained by Aβ42. Figure S3. STED images of Aβ42 focusing on the pre- or postsynaptic region in hippocampal neurons. 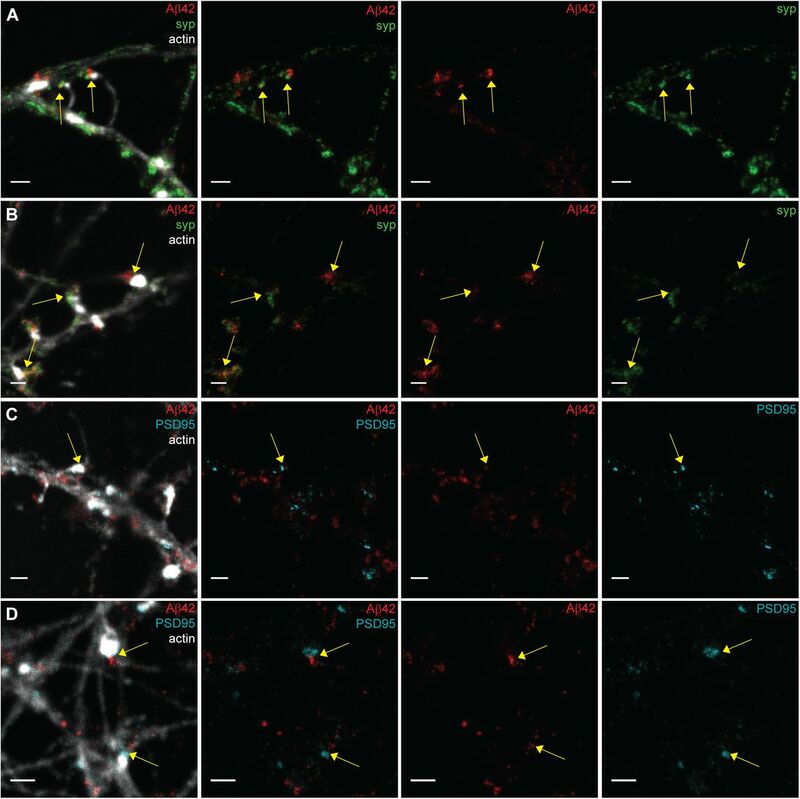 (A, B) Zoomed STED images of synapses showing Aβ42 (red) and the presynaptic marker synaptophysin (green) combined with actin in a confocal channel (light grey) in the left panel. The staining of synaptophysin and Aβ42 at presynaptic boutons connected to the postsynaptic spines are shown by the yellow arrows. Scale bars: 1 μm. 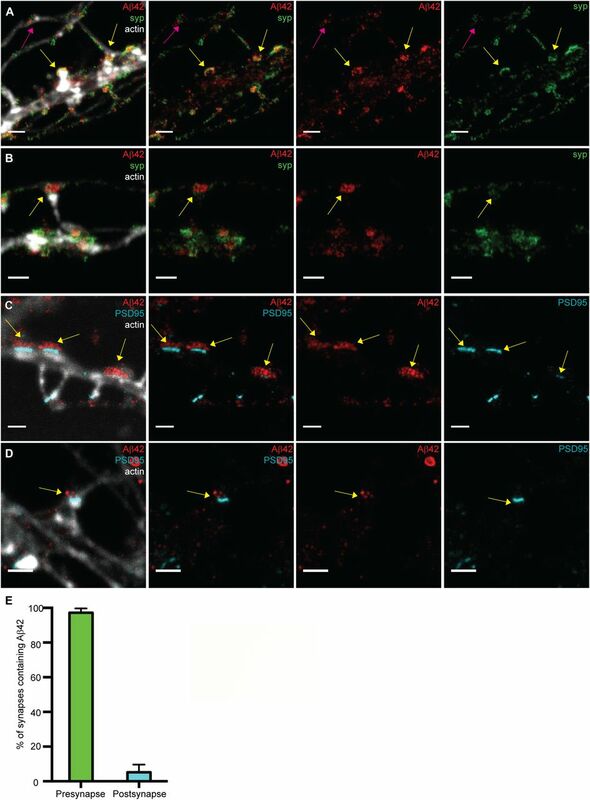 (C, D) Zoomed STED images of synapses showing Aβ42 (red) and the presynaptic marker PSD95 (cyan) combined with actin in a confocal channel (light grey) in the left panel. 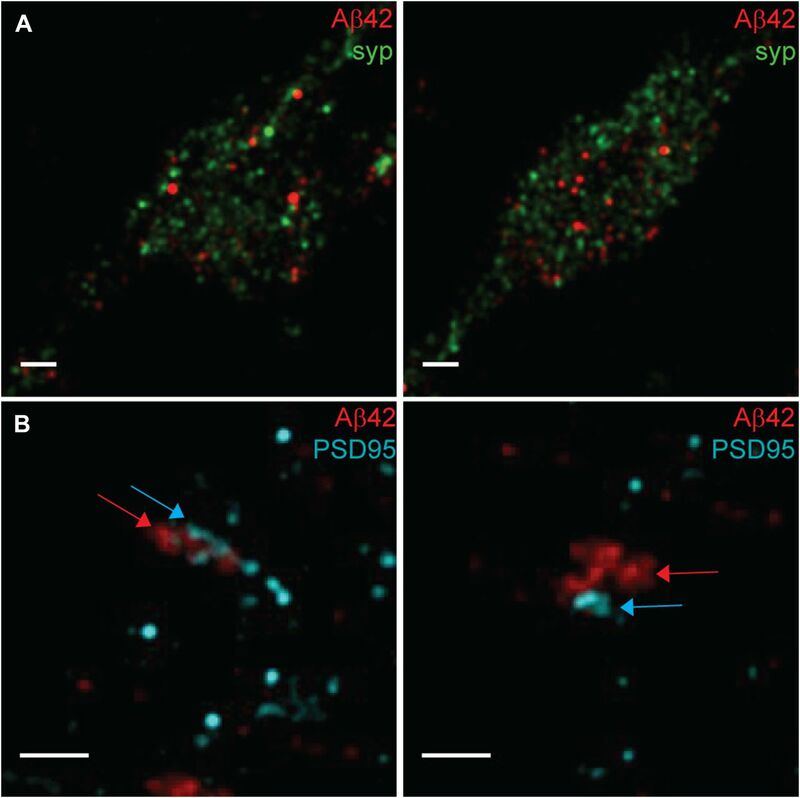 The staining of PSD95 at postsynaptic spines and Aβ42 at presynaptic boutons is shown (yellow arrows). Scale bars: 1 μm. Figure S4. Percentage of Aβ42 or synaptobrevin co-stained with synaptophysin in presynapses in hippocampal neurons. 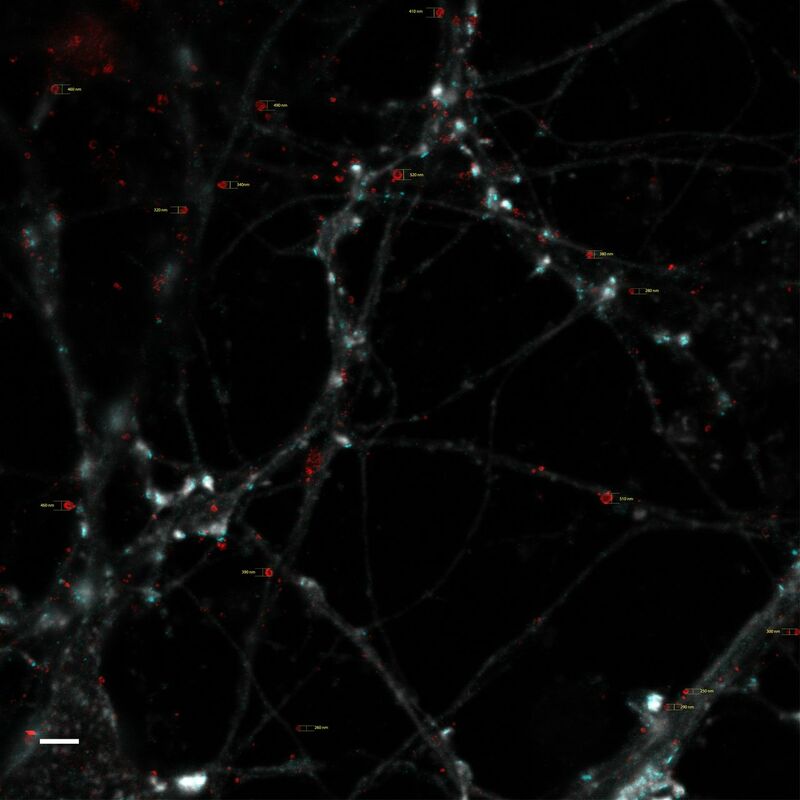 Colocalization between Aβ42 or synaptobrevin with synaptophysin staining in presynapses. The percentage of presynaptic marker synaptophysin (green) staining combined with Aβ42 staining (red) or another presynaptic marker synaptobrevin (red) was quantified from STED data using imageJ based on the area of staining using Otsu thresholding. Meta-chart was used to prepare Venn charts. 50 regions of interest were quantified for each staining combination. Total stained pixels in each region of interest was set to 100%. Figure S5. Diameter measurement for donut-shaped Aβ42-stained vesicles in nonsynaptic regions of the neurites. STED images stained with Aβ42 (red) and PSD95 (cyan) combined with an actin (light grey) confocal channel. 15 vesicles in total were measured using Adobe Illustrator. Scale bar: 2 μm. Figure 4. Aβ42 staining at nonsynaptic neuritic regions. 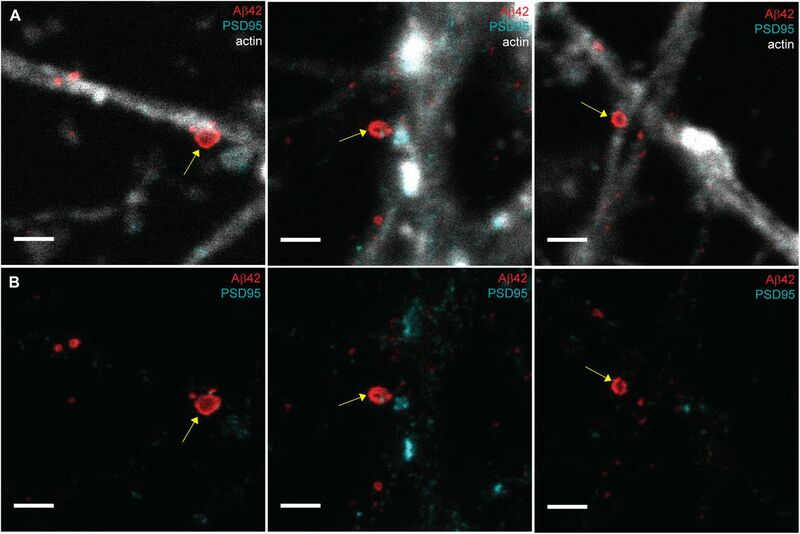 Zoomed STED images of Aβ42 (red), PSD95 (cyan), and actin (light grey) at nonsynaptic neuritic regions (A) and only the Aβ42 and PSD95 channel (B). Yellow arrows show Aβ42 vesicles which are hollow inside. The diameter from left to right is 520, 480, and 490 nm, respectively. Images were zoomed from Fig S3. Scale bars: 1 μm. Figure 5. Two-color dSTORM images of Aβ42 and pre- or postsynaptic markers. (A) dSTORM images show Aβ42 (red) and synaptophysin (green). Two different presynaptic regions from the same image are shown in the left and right image. Note that the Aβ42 staining appears as vesicles that are interspersed in the same region as synaptophysin. Scale bars: 500 nm. (B) STORM images show Aβ42 (red) and PSD95 (cyan). Two different postsynaptic regions from the same image are shown in the left and right image. Note the proximity between Aβ42 and PSD95, in agreement with a synaptic cleft between the two stains. The somewhat overlap in the left panel is probably related to the fact that the synapse is not in the plane of the image. Scale bars: 500 nm. Figure S6. 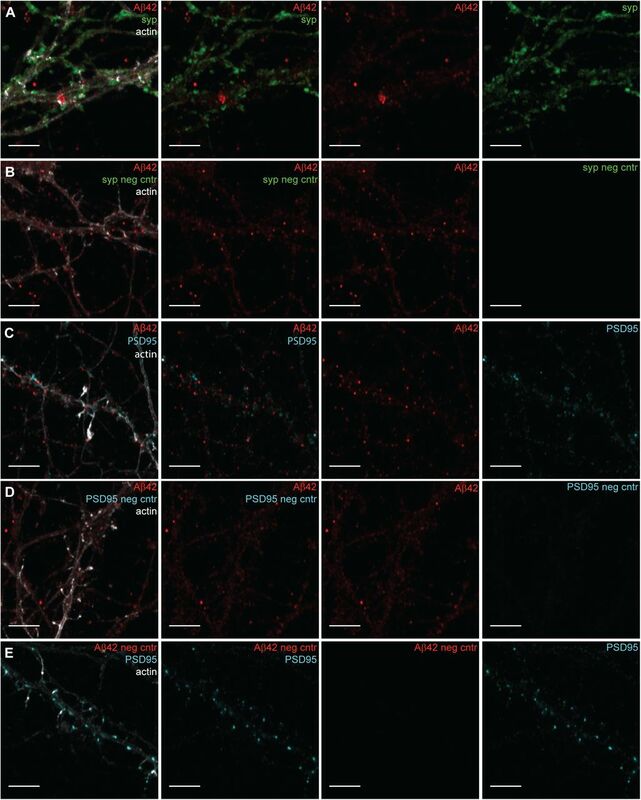 Synapses included in quantification of Aβ42 staining in presynapses in hippocampal neurons. STED images stained with Aβ42 (red) and synaptophysin (syp, green) combined with an actin (light grey) confocal channel. The yellow circles show synapses selected for quantification: 73 in total. Scale bars: 5 μm. Figure S7. Synapses included in quantification of Aβ42 staining in postsynapses in hippocampal neurons. 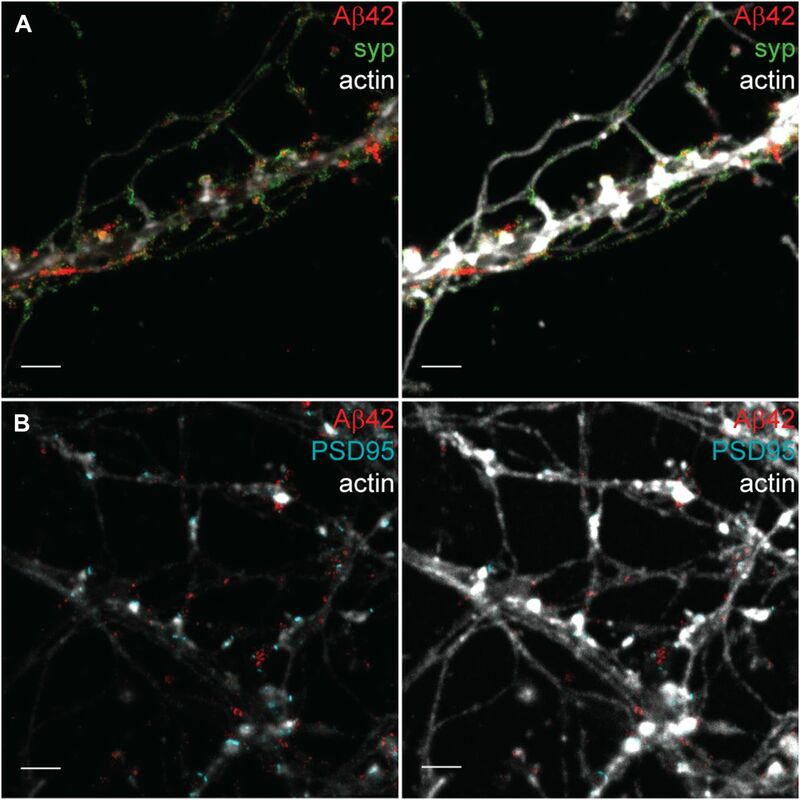 STED images stained with Aβ42 (red) and PSD95 (cyan) combined with an actin (light grey) confocal channel. The yellow circles show synapses selected for quantification: 73 in total. Bottom left scale bar: 5 μm. Other scale bars: 2 μm.